From forbidden love affairs and fiery political ones, to homegrown technological marvels, this gripping novel sweeps over the years and the globe, subverting expectations along the way. Sign me up to receive news about Namwali Serpell. I couldn't get into this one, and had to pass because of all the titles I have expiring soon -- definitely very creative, but the big jump in time and place and lots of antiquated references were just too abstract for me to connect. A map and/or timeline may help. When the publisher's blurb says it's the great Zambian novel you didn't know you were waiting for, it's spot on. It is a generation-spanning novel that mainly takes place in Zambia, a landlocked Central African country nestled beneath the Congo and east of Zimbabwe. It traces the history of Zambian society from Colonial times in the late 1800's as the British and Italians explored a new frontier, built dams, and escaped their own crowded cities to a new uncharted world, through Independence, to the events in 2020. It does this by exploring families that connected time and time again over a century plus. Mainly it follows the women's sides of the generational history, but not exclusively. It is a tale of sweeping generations, not one of a single quest or battle or even the story of a single life. Just as the reader gets comfortable with the story of one character, there is a time jump and the story continues with another character, seemingly unrelated and unconnected, but eventually connected in some manner. And what incredible characters are found in these pages. There's the Girl whose hair grows all over her body and spins and spins and spins. There's the woman possessed by a crying disease. The tennis-playing English girl who loses her sight and shockingly has an interracial romance. There are the Zambian cosmonauts aching to step foot on the moon. There's the abandoned women with children. There's the stewardess on the Zambian airline who meets the doctor. There's the chaos in the streets and more. The girl who falls out of a tree. The prostitute who opens a hair salon. There are broken marriages and reunions. There are penniless wanderers and doctors with numerous houses. There's the boy who builds drones and the scientists trying to cure the deadly virus that sweeps through Africa in the eighties. It's a rich stew of characters and a book so filled with stories that it simply is not a quick read. Although this literary achievement is quite outside my usual reading genres, it is quite a remarkable book. Many thanks to the publisher for providing a copy for review. 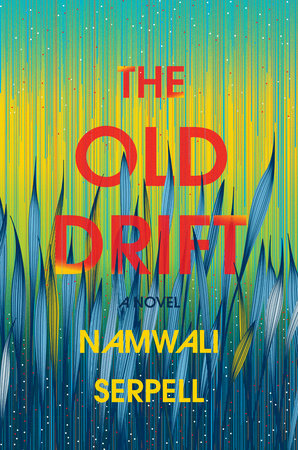 3.5 stars The Old Drift is a prodigious undertaking both in scope and time span. Set in Rhodesia/Zambia from 1903 to 2023, The Old Drift starts off as a historical fiction and ends as a futuristic parable. It is a generational tale that is as much about what makes a nation as what makes a family. In this debut novel Serpell addresses colorism, class differences, gender politics and revolution. She draws the reader's attention to the meek and disenfranchised while questioning the definition of progress. The narration is punctuated by poems told by a chorus of pests that correlate to the different time frames. Starting with colonialism (the mosquito/malaria), merging into capitalism (HIV/AIDS) and eventually ending with consumerism (drones), these pests serve as a metaphor for the human parasite. Cannabilizing the land from within, the colonist displaces the native, the capitalist mines the land of its natural resources and the consumer alters the environment. Although cleverly written, it took me a while to get into this book due to its many characters and elliptical nature. Not until about the halfway point did I firmly have the connections in place. At first I was frustrated by the organization of the book, my interest level waxing and waning between chapters. But when I reached the end and realized that this "Archimedean spiral" was intentional on Serpell's part, I had to applaud her for carrying out this feat. I am glad that I stuck with this book and can see why The Old Drift is getting so much critical acclaim. The writing was exquisite, the reader is left with razor sharp focus and portentous warning for our times. Special thanks to First to Read, NetGalley, Crown Publishing and the author Namwalli Serpell for access to this work of fiction.